Members and guests of The Opera Society enjoyed a delightful “Fall Membership Luncheon” graciously hosted by patroness Barbara Copanos at her lovely home in Sea Ranch Lakes on October 28. Opera Society President Barbara Parent welcomed everyone to the luncheon and presented the hostess with a gift. Music was provided by pianist and Opera Society member Ann Rentoumis. Robert Heuer, General Director & CEO of Florida Grand Opera, presented FGO supporter and volunteer extraordinaire, Trudi Faillace, with a beautiful book about the great diva, Maria Callas. This retirement gift acknowledges Trudi’s many years of service to Florida Grand Opera and The Opera Society. The book was autographed with good wishes from Mr. Heuer, members of The Opera Society and the staff of Florida Grand Opera. President Barbara Parent then called on Membership Chairman, Dr. Gloria Kline, who introduced new members: Marjorie Ferraro, Merry Hanson, Elisabeth Imhoff, Fran Koerner, Eric Koskoff, Dana Kiepura, and Karin Kuntz. The President introduced the chairmen of this season’s events. Mary Moschos and Isobel Sturgeon are co-chairmen of the popular “Guess Who’s Coming to Dinner” series. They distributed the GWCTD booklet to all the attendees. The booklet will be mailed to the rest of the membership. Melanie Camp and her co-chair, Jan Solomon, have planned a new and exciting three-part educational lyrical series called “Luxurious Lyrical Libations: A Tea, A Coffee and An Aperitif.” The first event will be A Tea featuring the “Dueling Divas” on November 17 at the Josephine S. Leiser Opera Center. Barbara Copanos, event founder, and Dr. Linda Balent will chair the “Diva Impresario Awards Luncheon” which will be held on February 17, 2009 at the Hyatt Regency Pier 66 Panorama Room. 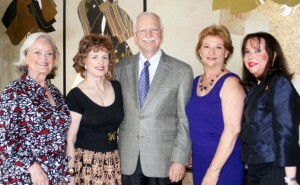 This event honors men and women who have been dedicated supporters of Florida Grand Opera. The honorees are Ben Harrison, Grand Impresario; Jane Robinson, Grand Diva; and Helena Caplan, Judy Drucker, Victor Mendelson, Rose Miniaci, Ann Rentoumis, Veronika & George Thorne, Ana Moran Varela, and Joyce Walker. Helena Caplan and Beatriz de la Rosa are planning “The Mad Hatters’ Tea” which will be held on March 18, 2009 at The Ritz-Carlton in Fort Lauderdale. Arlynne Vollmuth Bentsen announced that she, Rose Mary Zenobia and Joyce Walker are making plans for the Cultural and Humanitarian Awards Dinner, which will be held on April 3, 2009 at the Tower Club. This event honors men and women who have dedicated their lives to the betterment of the community. You can get more information on becoming a member, underwriter or sponsor for any event by calling Judith Carney, 954-728-9700 ext. 1700. All profits generated by The Opera Society events benefit Florida Grand Opera.